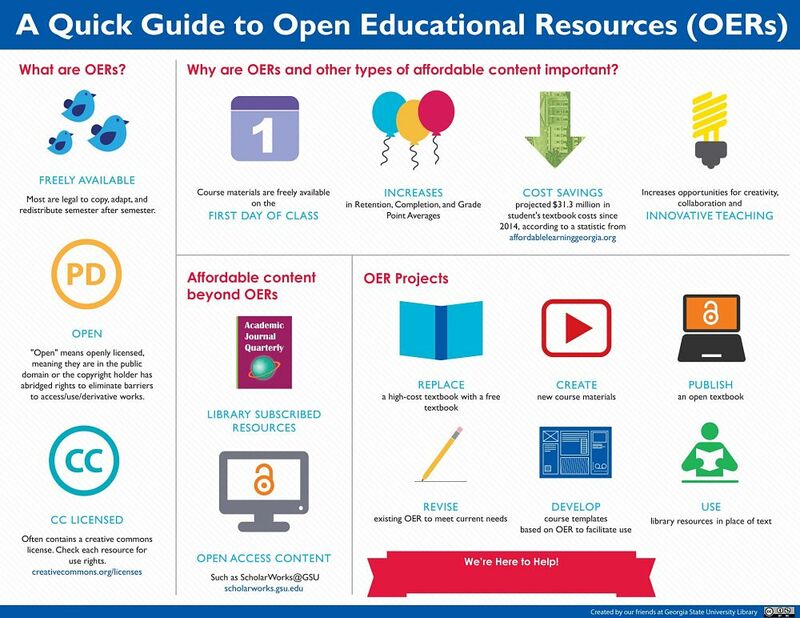 Thank you to Mary Ann Cullen from the Perimeter College - Alpharetta, part of Georgia State University, for allowing us to reuse the content of their Open Educational Resources (OERs) guide. ****How to link to/embed library resources in your GeorgiaView course. Chart w/ cost of textbooks vs. cost of living increase is on page 6. Financial aid covers less textbook costs now than in 2012. According to the article's abstract, "this study demonstrates that the USG’s ALG initiative helped students save money without negatively impacting learning outcomes. In addition, it is the first of its kind to measure some of these learning outcomes (e.g. final exam grade, assessment grade, and distribution of letter grades) at this scale." Bookstores - Questions often arise about the impact of OERs on the college bookstore and the revenue they generate for the college. The role of bookstores is changing, not only because of OERs, but because of competition from online booksellers and other factors. Some bookstores are finding ways to participate in OERs. Here are two examples: What about the the bookstore? and University bookstores change with the Times. OpenStax CNX allows searching and sharing of OER learning modules.